The teeth are some of the strongest parts of the body – even stronger than bones. With that in mind, the teeth are not indestructible. They can be “chipped” by a traumatic facial impact or by using the teeth as a tool to pry open a package or a bottle (please don’t try this!). Even a small chip in a single tooth can have a large effect on overall smile aesthetics. Fortunately, fixing chipped teeth is a standard and very commonly performed dental procedure. Our dentists at Eastern Virginia Family & Cosmetic Dentistry offer an array of treatment options that can provide effective solutions. One of our most popular options for a chipped tooth is the porcelain veneer. This treatment involves the placement of a custom-designed restoration that will “mask” the chip and renew the tooth’s structure and appearance. Porcelain veneers are delicately and precisely crafted for the best possible fit, and should look and feel as though the tooth was never damaged in the first place. They cover only the front part of the affected tooth rather than the entire tooth, and a strong dental cement will be used to hold the veneer in place. Patients who take good care of their teeth and attend the recommended amount of annual dental check-ups and cleanings often enjoy the results of porcelain veneers for decades. For patients looking for an alternative to porcelain veneers, cosmetic dental bonding can be another successful way to fix a chipped tooth. Cosmetic bonding typically does not yield results that can last as long as porcelain veneers; however, outcomes can be maintained for a number of years with the proper care. This treatment involves the application of a durable dental resin on the chipped tooth. The resin is tooth-colored for the best blend possible, and carefully sculpted and hardened to restore the tooth’s structural appearance. 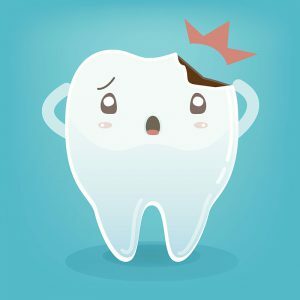 If the chip is quite severe, the overall structure and health of the tooth may be in jeopardy. In these cases, a porcelain dental crown may be necessary. Dental crowns fit over the entire tooth to provide the best possible reinforcement and protection. They are also custom-designed to provide a natural appearance and enhanced function. If you have a chipped tooth and are considering your options for effective treatment, please don’t hesitate to contact our practice today.